The WS-1050 is an Economy Wrist Strap and Coiled Ground Cord Set. 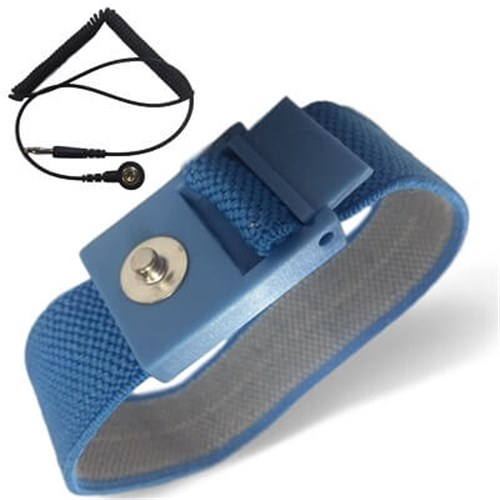 This set includes a Blue fabric wrist strap with a gray inner Conductive band. The strap is constructed with a plastic tension cap, equipped with a 10mm Machined Snap. The adjustable clasp has a medical-grade Stainless Steel back for conductivity. The included Coil Cord is 6 feet (fully extended) and equipped with a 1 meg ohm resistor. The Coil Cord is Black in color and is compatible with most parking stations or constant monitors.